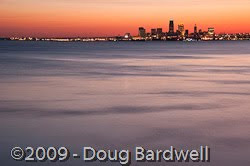 The Traveling Tripod: Travel Photography 101: Where can I get a classic shot of the Cleveland skyline? 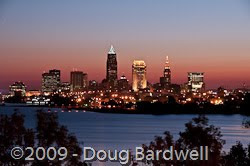 Travel Photography 101: Where can I get a classic shot of the Cleveland skyline? Traveling photographers will often ask, "Where do I go to get a great shot of the Cleveland skyline?" Luckily, in Cleveland, there's an easy answer. Two similar, but somewhat distinct locations immediately come to mind. Both are easily accessible, and neither involves a long hike from your car. Cliff Drive is the first spot, just minutes from downtown via Route 2 (a.k.a. The Cleveland Memorial Shoreway). Heading west, pass the entrance to Edgewater Park on your right and then make a right onto W. 103rd St. Keep to the right as the road makes a Y, and you will find yourself on Cliff Drive, a one-way street sweeping around a steep cliff, overlooking Lake Erie. Cliff Drive offers your first, panoramic glance at downtown Cleveland, with all its classic skyscrapers plainly in view. This first photo was taken from this location and offers a "tree-top" view of downtown Cleveland. Winton Place patio deck is another great vantage point. Located at 12700 Lake Avenue in Lakewood, Ohio, this high rise condo has a wonderful restaurant (Pier W) that cantilevers out over a rocky cliff with dramatic views of downtown from its tall glass windows. Just before entering the restaurant, there is a door that accesses the patio deck. The deck actually forms the roof over the restaurant. From this deck, another great vista view of Cleveland reveals itself. The advantage of this second location is a different perspective on the same scene. Granted, you still get a westerly view of the downtown skyline, but this location gives you the opportunity to have an unbroken expanse of water in your foreground. For a Google map showing these locations, click here. For more photos taken from each location, see the slideshow below. 2) Hopefully, you can also capture some sunrise shots with colorful skies which often occur about 30 minutes prior to actual sunrise. 3) Once the sun is up, a third set of photos might reveal more detail in the buildings with some nice warm light illuminating them from the sun. Three sets of photos in one trip, now that's a good deal. Do you have some other favorite locations for taking Cleveland skyline shots? If so, please share in the comment section below.